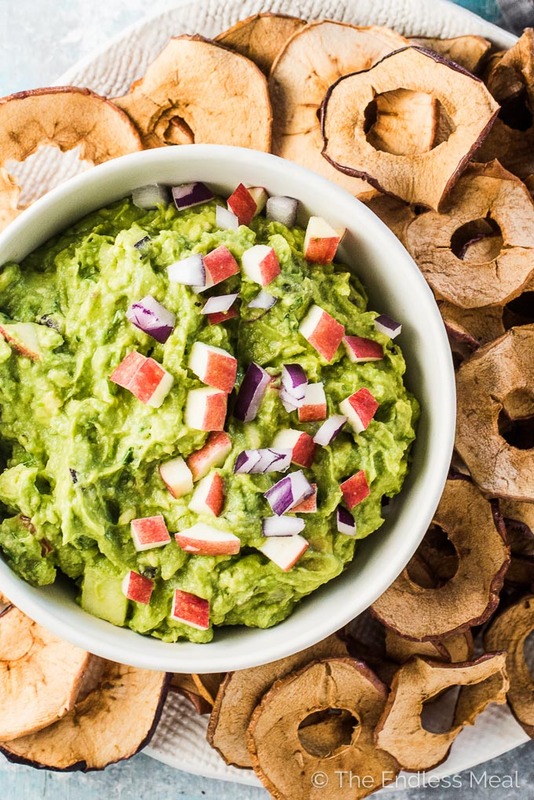 Apple Guacamole is the perfect fall snack. Finely chopped crisp apples add a little crunch (similar to onions) and a touch of sweetness. It's delicious! 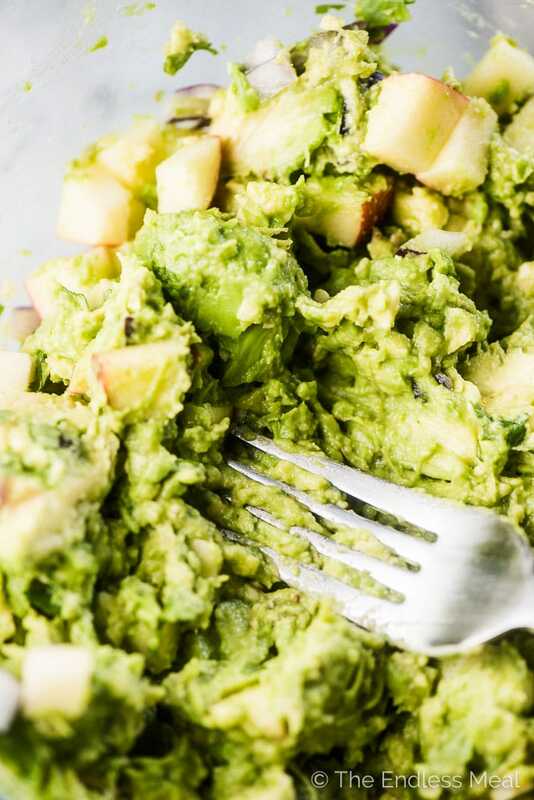 Finely diced apples add a little crunch to your guac, similar to the crunch you get from adding onions. 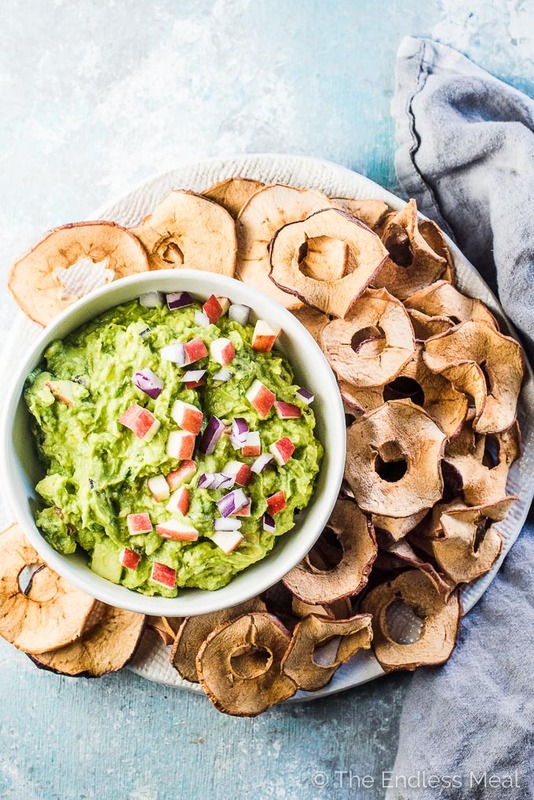 The apples give this guacamole recipe a little sweetness, which might sound weird but it totally works. 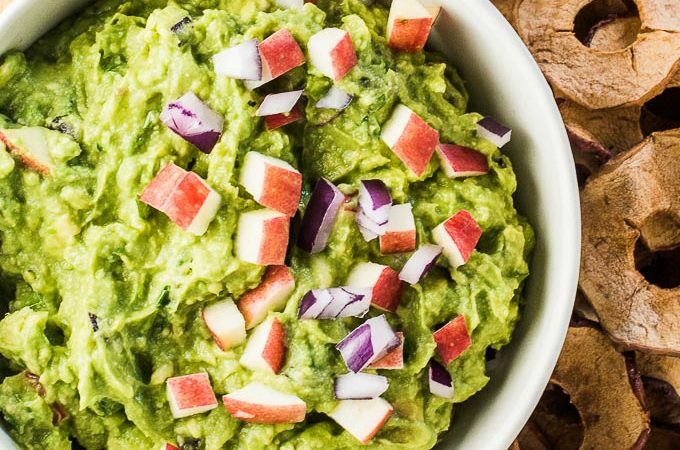 Apple guacamole is a light and fresh fall recipe. It's full on kid approved. ← I've tested this and know it's true. It's also full on adult approved. ← Also tested and true. Grab a bag of Martin's Apple Chips and dip away. Trust me, you'll be glad you did! See that bag of crispy apple chips up there? They are the best apple chips around. They are made by a Canadian farm family (from Ontario!) who grows the apples. They're crispy and perfectly sweet even though they only have one ingredient: apples. My daughter has been on a big-time Martin's Apple Chips kick this past month. I know she thinks of them as a treat, but they're a healthy (and a super convenient!) snack so I give them to her whenever she asks. When I was at Costco the other day, I saw they're now selling giant bags of Martin's Apple Chips. It got my mind racing about other ways to eat them. I think they'd be great on a cheeseboard or even served with some ice cream or as a dessert topping. 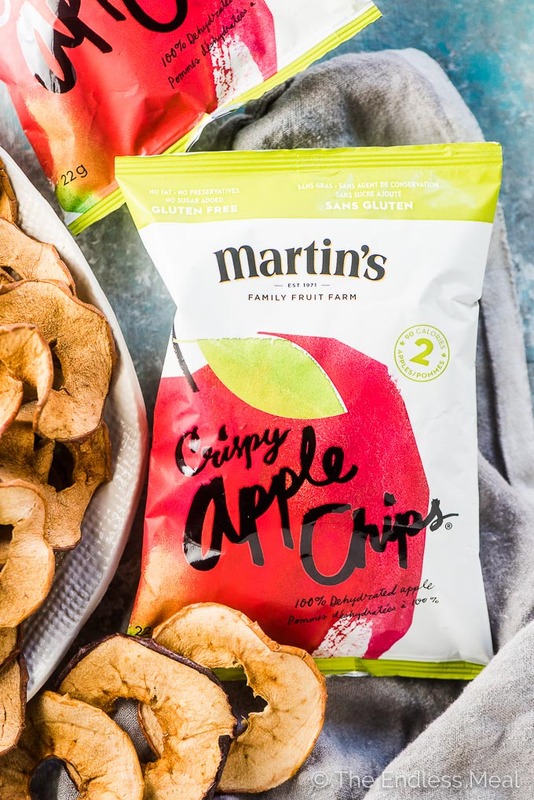 You can also find Martin's Apple Chips sold at Starbucks, Sobeys, Winners, Bulk Barn, Farm Boy, and many other retailers. How would you serve them? Add the ingredients to a bowl. Grab your apple chips and dig in! See how easy that was? Making apple guacamole is seriously the easiest ever. So perfect when you need a healthy snack stat! Remember to subscribe to THE ENDLESS MEAL'S NEWSLETTER for FREE to get healthy and delicious recipes each week + our cookbook! 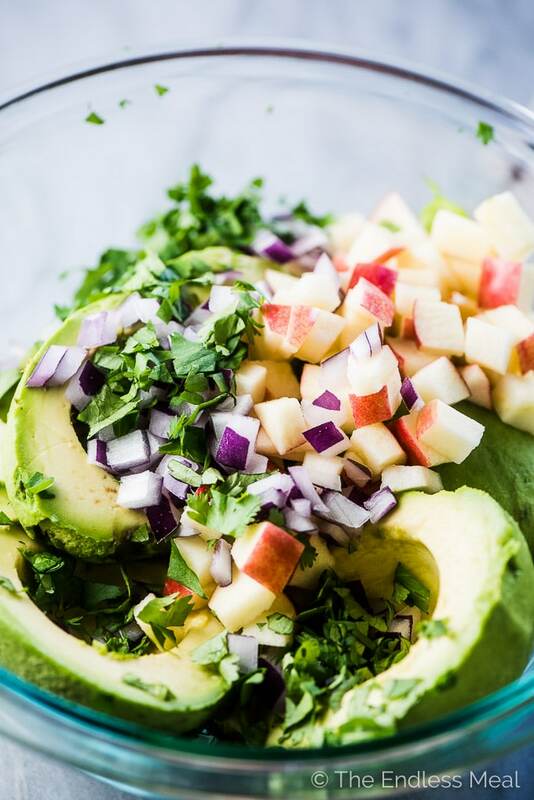 Add the avocados, apple, red onion, cilantro, salt, pepper, garlic, and lemon juice to a medium-sized bowl. Use a fork to mash the avocados and mix everything together. Serve with Martin's Apple Chips on the side to dip. I’d love to hear what you think of it when you try it! 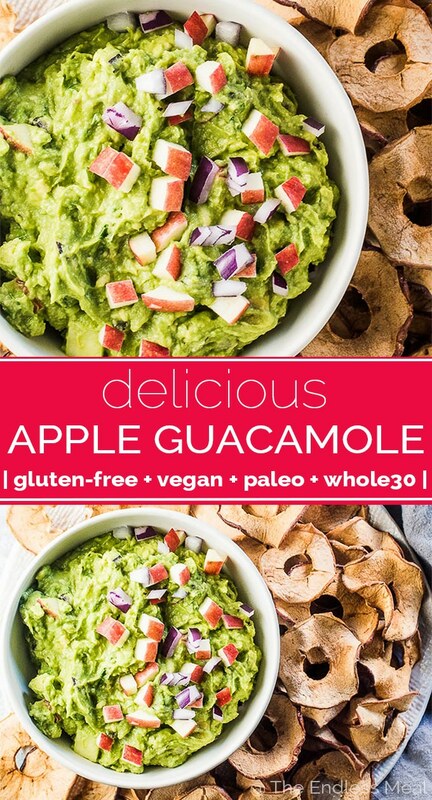 I LOVE guacamole, but with apples? I’m incredibly skeptical, but I was also skeptical about the combination of peanut butter and avocados. I actually LOVE that combination, LOL! Will definitely try this someday! My family was super skeptical about it too but raved about it and asked for more. Sometimes weird is good! And I haven’t tried avocados with peanut butter before. It sounds super strange but I’ll have to try it. Maybe it will be my next favorite thing!